Traditional rice cake flowers “hama-mochi” add color to New Year’s celebrations in Gifu prefecture. TAKAYAMA, Dec. 17 ― It is at peak to make traditional rice cake flowers, called hana-mochi, to prepare New Year’s celebrations in Gifu prefecture. 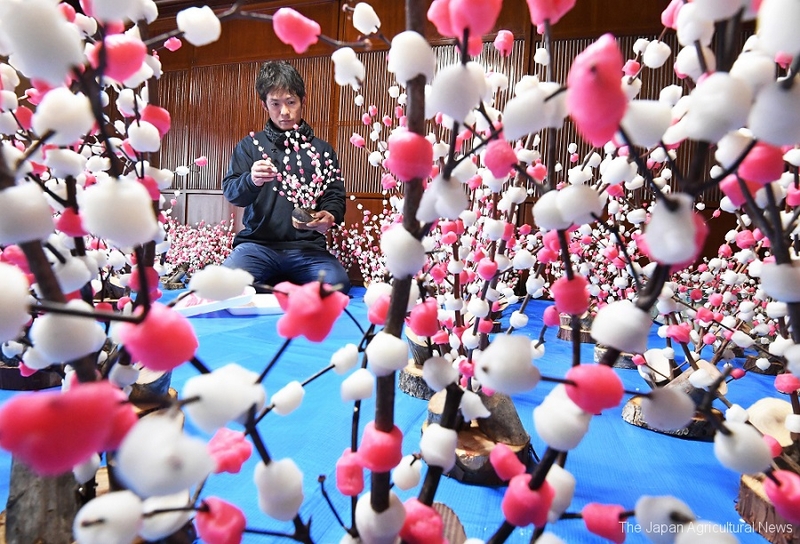 Farmers are attaching pink and white rice cakes, which represents flowers, on to a real branch. It’s simply because there was a difficult time to decorate fresh flowers for New Year’s celebrations in the snowy Hida Takayama region in northern Gifu. “There are several ways to display hana-mochi,” says an official from a farmers’ cooperative from the region. “You can place them with other fresh flowers like an ikebana (Japanese floral arrangement), or place them in your favorite vase,” he smiles. Hana-mochi will be later made into rice crackers to eat. This entry was posted in Others, Photos. Bookmark the permalink.